An FOI request has unearthed serious failings at a key unit of Queen Elizabeth Hospital, Woolwich (QEH). This hospital was merged with Lewisham hospital in 2013 into the Lewisham and Greenwich Hospitals Trust (LGT), as a supposed way of overcoming huge PFI debts and putting both hospitals onto a more sustainable financial track. The report, dated February 2017, details some very worrying practices, presumably a means of working round shortages and cuts: “younger fitter patients with single organ (usually respiratory) failure, would often not be admitted to the critical care unit until there is multi organ failure due to pressure on bed availability.” That is, a treatable condition becomes potentially terminal. These findings are only the latest in a series of disturbing failures detailed in a 2015 Care Quality Commission report that the A&E department at QEH was ‘unfit for purpose’, and in the problems at the ICU revealed by the junior doctor, Chris Day. Merger of a PFI laden hospital with a nearby one is a common way to spread the costs of PFIs. Such mergers usually require significant subsidies to support both merger and future PFI payments. The Department of Health and other bodies spent £2bn between 2010 and 2015 supporting 12 mergers, often the result of financial difficulties caused by PFI contracts. Nevertheless this report shows clearly the dangers of merging complex organisations. ‘Bed availablity’ problems may often be traced to the effects of PFI. Loss of beds is a recurrent theme of hospital PFIs – the first wave of PFI projects saw average cuts in bed numbers of between 7 and 44%. QEH saw a 12% reduction in beds available following PFI. General financial constraints, due in part to the continuing pressures of PFI debts can be seen throughout the report. According to the government the unitary payment for QEH and Lewisham hospital in 2015-16 was £37m. £16m of support for PFI is provided by the government, leaving a total payment of £21m. The Trust’s deficit for 2016-17 is anticipated to be £20m assuming further government financial support to cover future service changes. Queen Elizabeth Hospital was built as a PFI hospital and opened in 2001. In 2009 it merged with Queen Mary’s Hospital, Sidcup and the Princess Royal University Hospital, Bromley (PRU), also PFI-built, to form the South London Healthcare Trust (SLHT). By 2012 the PFI payments incurred by QEH and PRU had reached 18% of the Trust’s annual revenue and SLHT was effectively bankrupt. Under legislation introduced by the Labour government in 2009, failing NHS trusts or ‘unsustainable providers’ could be dealt with using a ‘Trust Special Administrator’ (TSA) appointed by the Secretary of State. A TSA was accordingly appointed by Andrew Lansley in June 2012 to deal with a deficit of £150m. Unsurprisingly the recommendations prompted a determined local response. A campaign quickly called two demonstrations in November 2012 and January 2013, attracting crowds of 10,000 and 20,000 respectively, some of the largest local demonstrations ever seen in Britain. Nevertheless the Secretary of State for Health supported the TSA’s recommendations. 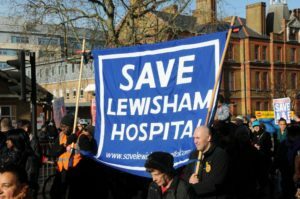 Meanwhile the managements of QEH and Lewisham pushed ahead with the merger of the two hospitals, while also supporting the campaign’s demand to ‘Save Lewisham hospital’. The campaign’s legal challenge to the Secretary of State’s decision focused purely on the closure of key departments at Lewisham hospital and did not challenge the merger. Nor did it challenge recommendations affecting the other hospitals in the former SLHT: as a result of the TSA’s recommendations, the A&E at St Mary’s hospital, Sidcup, was downgraded forcing patients to travel long distances for care. The judicial review ruled that the Secretary of State for Health had no power to enforce the closure of key departments at Lewisham hospital. This outcome effectively removed the immediate threat to Lewisham hospital but the merger went ahead, PFI debts remain with consequences for some departments at LGT as revealed in this new report. The new report on QEH ICU shows clearly the dangers of merging complex organisations. Merger is NOT a sustainable solution to PFI contracts, is itself costly to implement and carries increased risks to the public. PFI was and remains one of the main constraints on the hospital’s (and the Trust’s) ability to function safely and needs to be tackled root and branch. Source: HM Treasury, Infrastructure and Projects Authority Private Finance Initiative and Private Finance 2 projects: 2016 summary data: https://www.gov.uk/government/publications/private-finance-initiative-and-private-finance-2-projects-2016-summary-data. All figures for future unitary payments are nominal and undiscounted. South London Adult Critical Care Operational Delivery Network Peer Review: Intensive Care Unit, Queen Elizabeth Hospital, Woolwich. 8th Feb 2017. Trust and NHS in south east London.